Is it sensible for India to follow US’ footprint? One of the achievements that China and India made on the diplomatic front in 2018 was the improvement in bilateral relations. The informal Wuhan summit between Chinese President Xi Jinping and Indian Prime Minister Narendra Modi in April marked a new milestone for Sino-Indian ties. Significant progress has also been seen in military and economic exchanges. Yes, it seems some geo-strategists from India are reluctant to embrace the new momentum and continue to view China's policy initiatives with an outdated mindset. In his recent column "China is at a crossroads" published in the Times of India, Brahma Chellaney painted a gloomy picture of China's future. He predicted that as the international factors that aided China's rise are eroding, the changing international environment holds important implications for China domestically. The author holds the opinion that China will also disregard the interests of its neighbors amid changing international dynamics, adding to regional uncertainty. This is another example of hyping the "China threat" theory. Not long ago in 2016, then US President Barack Obama argued that "a weak China that could not contribute to solving global problems was more dangerous than a strong and potentially aggressive China." In two years, the US has adopted an increasingly hawkish China policy, defining the country as a strategic competitor, a policy line that transcends partisan division. Chellaney's view could be representative of certain Indian elites. They may be echoing what US hawks are advocating toward China. 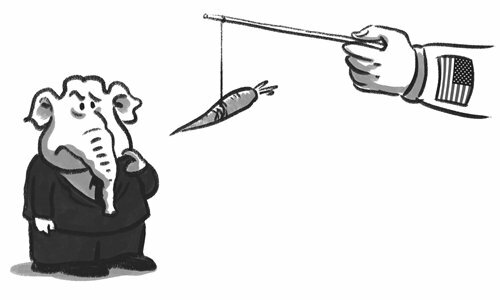 The US policy adjustment is driven by a relative power shift between China and the US, while at the same time blaming China for its internal problems. But is it a wise choice for New Delhi to dance to the tune of Washington? Speculating that China will adopt a tougher line with its growing strength is a serious misperception of Chinese diplomacy. Peripheral diplomacy has received greater importance in China's overall diplomatic efforts, achieving remarkable progress in regional stabilization. For example, the South China Sea. After the South China Sea arbitration ended in disgrace in 2016, the Philippines, the main instigator, withdrew from the futile strategy and turned to a practical China policy to facilitate cooperation. Since then, the two countries have launched joint efforts in oil and gas exploration and infrastructure development. Negotiation on the South China Sea Code of Conduct between China and ASEAN, a regional mechanism to address maritime disputes, is also underway. It is an endeavor aimed at establishing security order by regional countries. China and India have overcome strategic distrust to advance bilateral relations. The two countries have moved beyond the shadow of the Doklam standoff and the positive momentum is expected to continue this year. India has enjoyed a fast development pace among emerging countries in recent years, attributable to its stable environment, including with China. As a regional power with promising potential, India is often lured by other global powers to counter China's influence. The Trump administration defined the Indo-Pacific strategy, roping in India along with its traditional Asia Pacific allies, to contain China's rise. The strategy may give New Delhi an illusive sense of significance in the rivalry between China and the US, but it is doubtful how much the US intends to invest in such a strategy and whether India can truly benefit from it. China won't turn conservative even without Western support. Against the backdrop of the US withdrawing from several international organizations and multilateral mechanism already under threat, China is an important force to buttress globalization and multilateralism, the cornerstone of today's international order. Economic development is on top of the agenda for the Modi government. Instead of toeing the US' policy line and joining the "China threat" chorus, seizing the positive momentum of the previous year to further promote China-India ties is of best interest to New Delhi.